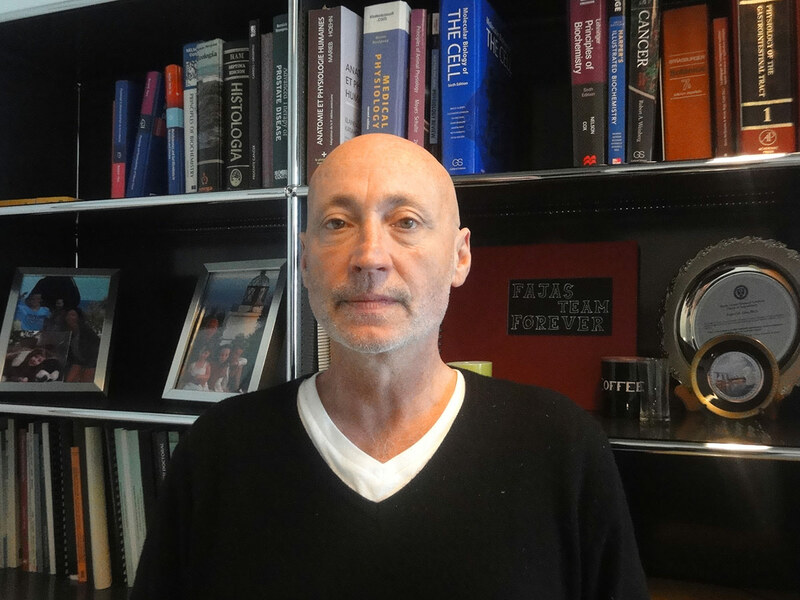 Prof. Lluis Fajas Coll and his team are walking along a hitherto deserted research path, unraveling the complex interplay between cell cycle regulation and metabolism – two phenomena that have been, for too long now, scientifically approached as independent, without biologically relevant interaction. But in recent years, the minds of not a few researchers have been turned. And not without reason: understanding the mutual interplay between cell cycle regulators and metabolic processes under normal and pathological conditions sheds new light on the understanding of metabolic diseases. – Prof. Fajas Coll, for some time your research work has been considered “uncommon” by your colleagues. Are you a pioneer? LF: It is not up to me to describe myself in those terms, but it is true that, since my PhD work, I have been interested in the interplay between cell cycle regulation, proliferation and metabolic processes, a somewhat uncommon approach, indeed. For a long time, those processes were considered separate phenomena, with little or no cross-talk. Although, there where scientific indications that both were interconnected. – Could you give an example? LF: For example, genes involved in metabolic pathways were regularly picked up during transcriptome profiling in cell cycle research, but all too often the physiological relevance of those observations was not fully appreciated and/or was not considered interesting. Although I want to emphasize that times are changing: several groups are approaching both fields from a new research perspective, thereby making important contributions. – Could you briefly outline the kind of work that is being done in your team? – Have you made progress thus far in tackling this question? On the other hand, controlling the metabolic re-programming – new metabolites, nucleic acids, lipids, etc. have to be synthesized upon nutritional challenges – which is required by a cell in order to adapt to the new condition, such as entering another cell cycle. – Which cell cycle regulators are in focus of your research? LF: We are presently focusing on Cdk4 (cyclin dependent kinase), the Retinoblastoma protein and the E2F1 transcription factor, which are interconnected in the Cdk4-Rb- E2F1 regulatory network, which plays a central role in the coordination of metabolic processes, also in non-proliferative cells. PM: Our major hypothesis has important pathophysiological implications, since we could demonstrate that the activity of cell cycle regulators is altered in metabolic diseases, such as obesitas and diabetes. This impact of cell cycle regulators on strictly metabolic pathologies was completely unexpected. For example: we have demonstrated that E2F1 is not only involved in adipocyte differentiation, but in insulin secretion in pancreatic β-cells as well and has an important effect on oxidative metabolism. On the other hand, our data show that Cdk4 is active in insulin-responsive tissues – and phosphorylates a protein in the insulin signaling pathway – under non-proliferative conditions, strongly suggesting that Cdk4 plays a role beyond the control of cell proliferation. – Do I hear you saying that your research work has clinical relevance? – … but not exclusively? LF: That is correct. Presently, we have a project going on, that could be categorized as “clinical research”. LF: At present, there is a major issue in the field of metabolic diseases, namely the unresolved question why some obese persons develop insulin resistance or diabetes, whereas others do not: the so-called “healthy obese”. Now, given the fact that Cdk4 is involved in metabolic pathologies, we wanted to find out whether kinase activities – like for example Cdk4 or other kinases, possibly but not necessarily downstream from Cdk4 – could be responsible for some of these observed differences. To that end we compared the complete set of kinase activities between the adipose tissues from patients that are obese insulin resistant versus persons that are obese, non-insulin resistant. Or in other words, we performed kinome profiling, using PamGene array technology, whereby kinase peptide substrates are immobilized on a matrix and can be phosphorylated in situ. Using this approach – comparing on a global scale up- or down phosphorylation between the different samples – we have identified 5 different kinases that are differentially expressed between both samples and might be causally linked to the observed metabolic differences between diabetic versus healthy obesity. Surprisingly, none of these kinases have ever been studied in the context of metabolic diseases, although they are not unknown in the cancer field. LF: At present we are in the process of validating the biological role of these kinases in normal and diabetic mice, by functionally inactivating them, either by using specific inhibitors or constructing knock-out animals. For example, we are focusing at the moment on two kinase activities that are high in obese diabetic patients and low in obese healthy persons. – What do you hope to find? LF: By functionally inactivating these kinases, we hope to detect an improvement in the diabetic status of the animal. – That would be very exciting no? LF: I can only agree (laughs). – What could be the clinical relevance of such an observation? LF: Eventually, these kinases could come into focus as therapeutic targets in the treatment of diabetes. But it is far too soon for even speculating on such a scenario. Let’s wait and see what happens in the mouse model. FM: I agree. Since a couple of years, it has become clear that metabolic pathways are involved in a wide variety of biological processes. For example, one could replace “cell cycle regulators” by “oncogenes” and the outcome would be comparable; in order to transform a cell and trigger malignant proliferation, cellular metabolism needs to be rewired – under the control of oncogenes, in a manner that might be comparable to what we have observed with cell cycle regulators. For that matter, the interplay between cancer and metabolism has become a hot topic. At the moment some pilot clinical studies are evaluating metabolic therapies to treat cancer, something which was unthinkable 5 years ago. Along those lines, we have a project running comparing transcriptome and metabolome data, aiming at elucidating the role of the transcription factor E2F1, a cell cycle regulator, in re-programming metabolism during malignant transformation. – What is your scientific dream? Feel free to speculate. LF: The word that comes into my mind is “integration”: a key word, together with “adaptation”. Given the fact that cells are not individual entities, but part of a tissue, an organ, an organism, I would like to understand how – depending on the environmental conditions and specifically nutrient sensing – cellular responses are coordinated at an organismal level. How does the same stimulus trigger communication, adaptation and eventually integration of a unique response? So, to answer your question: I would like to understand physiology.